This is our master directory of program developments. It continues to reveal more about each program and ultimately takes you to the primary program development page where full details can be found on its mission, purpose, and the opportunities it presents. We are excited to share the details with you all and hope it inspires you to learn more. The way we are going to present our program infrastructure to you is to explain the esports industry from the top level and explore some of its subcultures along the way. Esports represents a segment of the gaming industry fixated on professional levels of competitive video game play aimed at entertaining viewership, promoting rivalry, and elevating production. We’ve provided a quick snapshot of industries we all have heard of. I know many of you may go crosseyed with numbers, but we all know money is a great motivator and justifier for things to exist. We all also know that relating new concepts back to industries we all know and are comfortable with does give perspective. Enough about numbers! Let’s talk about what this all looks like. The easiest way to introduce those who do not know anything esports is to take the Super Bowl to replace the physical contact sport with two teams of gamers playing Madden on an Xbox, but leave 100% of everything else the same. That means leave the production standards, the marketing, the advertising, the performances, the analytics, the sportscasting, the camera crews, the ticketing office, the broadcast, and so much more. Did that not help you? We’re linking the intro ceremony performance to one of the biggest world esports events next to this paragraph. Make sure to take notice that this is The Nest Olympic Stadium in Beijing, China. It is not small. This final showcase drew in 57.6M viewers(CBS8) versus the NFL’s Super Bowl at 103.4M and the NBA’s Finals at 17.56M in 2018. Take a moment to watch some parts of the LoL (League of Legends) opening ceremony and definitely take a look around the three-minute mark to see how esports can use technologies like augmented reality to bolster entertainment programming and streaming. Now we know what most of you might be thinking? So in a nutshell, this is about students playing games on a higher level but ultimately just about playing games. You’re not wrong, but the entertainment we get from variety shows, sports entertainment, and gaming all are revenue generators regardless of the subject matter intricacies. We’ll dissect this one step further in the next section. 2017 Riot Games’ League of Legends World Championship Finals at The Nest Olympic Stadium in Beijing, China. If you make it to 3:00 you’ll see how esports and gaming are pushing augmented reality for entertainment as well. WHAT DOES HIGHER EDUCATION HAVE TO DO WITH ESPORTS? If you took a moment and watched the opening performance from The Nest in China I want you to pause a second right here and think about the logistics it took to make that happen. Production teams, stage development, live streaming broadcast teams, and legal. This still isn’t a full picture of the opportunities a higher education institution can assist with solidifying the industry infrastructure. Our goal at the University of Oklahoma is to advocate and partner with our academic components on campus to find ways to help each other in our individual and global missions alike. Grand opening of the Esports Stadium Arlington, the worlds largest dedicated esports venue in the world. (Nov. 2018) We were able to attend thanks to press passes granted through our efforts within our Media & News Department. The University of Oklahoma has degree plans in Journalism, Business, Entrepreneurship (Business), Law, Social Work, and more that can correlate with our objectives. While we do not have well-developed relationships quite yet we have tons of students from those disciplines that are helping us solidify our programming and infrastructure in the club and paving the way. The collegiate campus continues to be one of the best places in the entire industry to develop esports infrastructure. We have the age demographics all in one place, meeting spaces, are already teaching and training future professionals, and have an abundance of technology that can be used for this purpose. Learn more about the University of Oklahoma, Click HERE! Members of the 2018-2019 roster Overwatch Premier Team at OP Live Dallas in September 2018. Placed 2nd out of 16 after only being organized 28 days. To kick off our primary focus we researched tournaments in the industry that have collegiate only focus and offer prize pools that paid through scholarship. We are currently entering into six different titles across 16 teams with student, faculty, and alumni coaching sprinkled throughout. We are also enforcing wellness-based activities to teach balance as well as ensuring our student competitors maintain a healthy academic GPA to boot. This topic, while at the top, is one we knew was the easy one. Not in the sense to compete and rank highly, but to find the energy to create teams and field them all while wearing the venerable OU interlocking logo on their chest. BOOMER SOONER!! 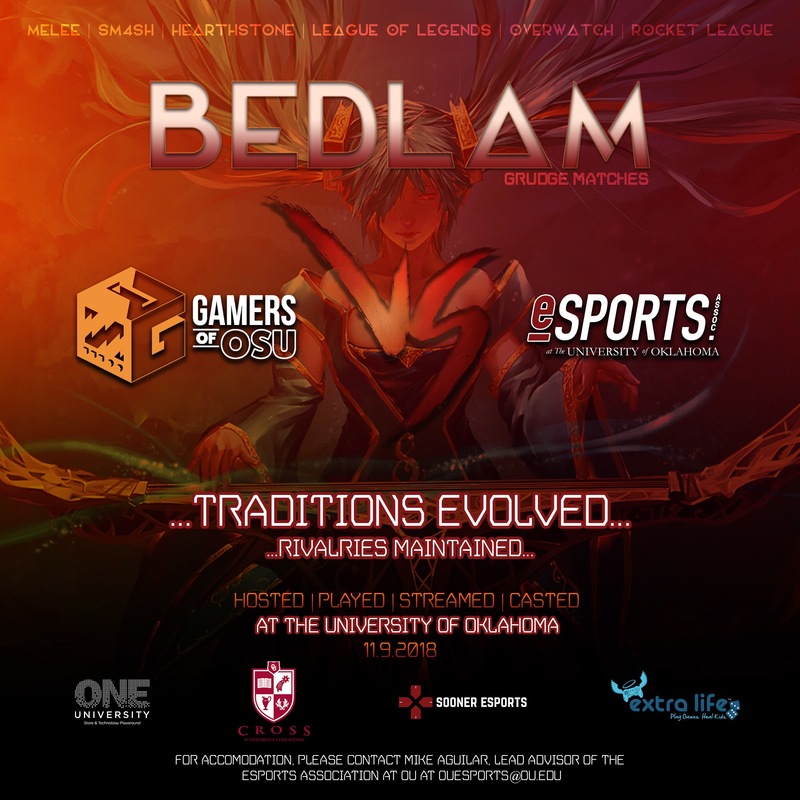 We have been competing now since Spring 2018 and have hosted a bedlam event on our campus with Oklahoma State University and are collaborating with multiple other universities, governing bodies, and well-established businesses to bring the Sooner strength to this new industry. One of the biggest challenges in what people are used to in analog sports is having standard tournaments and matches we’re all accustomed too. Like NCAA Final Four, NFL’s Super Bowl, or the MLB’s World Series. These type of events are all coming as an inevitable milestone towards more mainstream acceptance and formalization. Tespa, one of the tournament organizers and governance providers, put their national Overwatch collegiate finals in the Fiesta Bowl now and we’ve heard some pretty solid rumors of another big household name bringing a brand new tournament for the Spring 2019 semester. Our first cluster of programs falls under journalistic energies and we broke them into three segments. We looked at the macro view of the industry and came to the realization that Michael Jordan would not have been as popular if hadn’t been broadcast, the subject of talk shows, interviewed, and featured in marketing and branding campaigns. So we set off to become our own biggest horn tooters and educate anyone and everyone willing to listen by putting pen to paper, face to camera, and mouse to game. We will become our own ESPN, Sports Illustrated, Monday Night Football, NCAA Final Four, and more! The first is responsible for the main purpose of this website which is to advocate for our cause through a healthy and consistent display of articles, reviews, opinion pieces, event coverage, and more. It is the primary force behind the Sooner Esports website. They function as the educational piece of our organization to showcase who we are as a community, culture, and Sooners in esports. This program is called “Media & News” and is designed to infinitely scale up and down based on student interest and talent regardless of discipline. This program flexes many of the same disciplines that would be taught in core journalism disciplines. The second program is called “Shoutcasting” and the best way to describe it is the analytic and entertaining sportscasting team you would see during the broadcast of your favorite live sporting event. It is comprised of students, regardless of official discipline, who are interested in providing real-time analysis with play by play announcing or supplementing with color casting and doing after-match reviews. This program will help develop a team capable of covering all the titles we officially develop for intercollegiate competition both physically and online through various streaming services, leveraging streaming services like Twitch, social media channels, and this website we already have all the platform pieces in place. This opportunity we also open up to OU alumni to be part of this team. One of our members streaming setups used for our programming. The third and final program is “Streaming Entertainment”. This program capitalizes on an influencer-style livestream of the gaming industry. You will find members of OU Esports playing video games in real-time and interacting with their viewers. Our stream will also include our version ESPN’s SportsCenter, a show that reports esports & gaming news, and variety programming that cater to subcultures in gaming – from top-tier Overwatch gameplay to cosplay creations, there will be something for every gamer. This opportunity is not just for OU students and faculty, as we will allow OU alumni to participate in this program soon. From the Oklahoma Memorial Union, Super Bit Wars 6, a yearly fighting game community tournament that originated on OU’s campus in partnership with HXC Gaming Events. This department is the lifeblood of the entire organization. It has two main focuses. First, cater to OU students and develop engaging programming for OU students to enjoy whether that is a casual board game social mixer, an Overwatch tournament, or a watch party for one of our teams or a global event, this team facilitates the event coordination for all of that. Leveraging a middle management role called the “Ambassador” we are able to program for a wide variety of demographics and not just our core intercollegiate competition energies. The other side of our community developments focuses on outreach to K-12, at-risk youth, and the general public. This can look like programming at a local library to use gaming as a means to connect and inspire youth, collaborating with K-12 school systems to develop recruitment pipelines, or putting on a big production in an eBedlam rivalry to draw in support from the Sooner Nation! Kris Davis (Advisor), Bob Bowlsby (Commissioner, Big XII), Mike Aguilar (Lead Advisor), Jack Counts (President, 2017 – ) as the Big XII Esports Forum in Dallas, TX – Spring 2018. To tie everything together, we need strong leadership. The goal from the advisors is to create peers through mentorship to grow and empower students to take ownership and stand toe to toe with industry leaders. We do this by allowing students to grow and evolve each of the programs mentioned above organically as our developments mature and the industry changes. Students that are part of our “Leadership Development” are put in direct contact with industry leaders, sit in the conversations with partnership opportunities, and help us collectively push our agenda forward. Within the leadership development, we have fundraising, finance, top-level administration, and social media and marketing strategic planning. Our staff, faculty, and alumni advisors are also getting connected into the industry and are becoming influencers across the landscape to help pave the way not just for OU, but for as many logical segments as possible. Our Lead Advisor, Mike Aguilar (2nd from right), sitting on a panel for the SEAT conference aimed at advising decision level administrators across the sports entertainment industry like the NBA, NFL, NCAA DIVI/II schools, etc.. With him is representation from Major League Soccer and Pro Esports Organizations Tempo Storm and Gfinity UK. As you can see, this is much more than just playing video games. Our goals are to build professionals to support this exploding industry as it continues to gain massive momentum as we stay ahead of the mainstream curve. All of this while advocating for our interests and adding value in community programming, curriculum evolution, and tangible networking to grow real leadership for an industry that needs more and more infrastructure and sustainability. There are more and more resources on the analytics of all of this and documentaries popping up highlighting different elements of this massive topic. If we sparked your interest then please take some time and explore it further or reach out to us and our Lead Advisor would love to share insight and perspective! Welcome to the next evolution of the University of Oklahoma intercollegiate competition, campus life, and the next expansion for fans of the Sooner Nation! OP Live Dallas stage during our match against UT Arlington.